drivingandlife: INFINITI Q50 S - DOES IT HAVE A QUOTIENT OF 'C'? 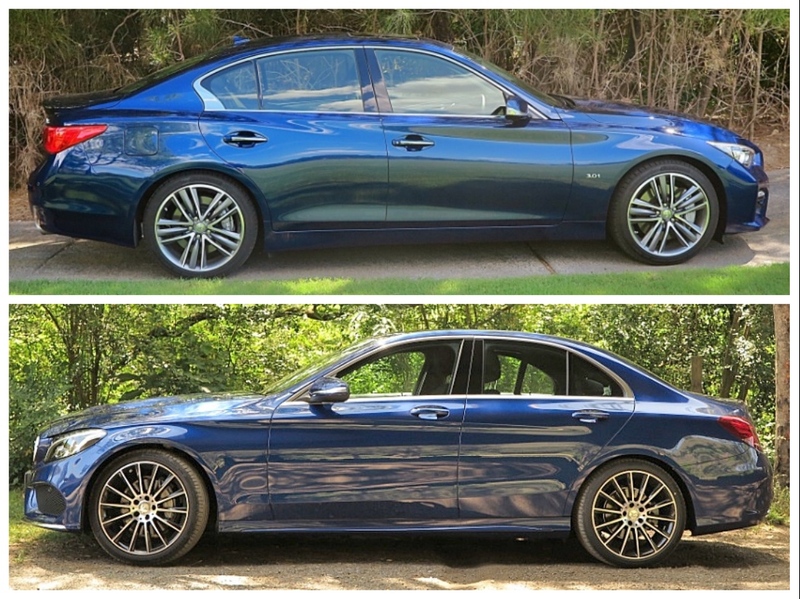 On paper the Infiniti Q50S and the C-Class 250 are the same price, and more or less the same spec. Okay, you’ve got a choice. Or, have you? The terrible thing about comparing things on paper is the missing quotient – real world experience. 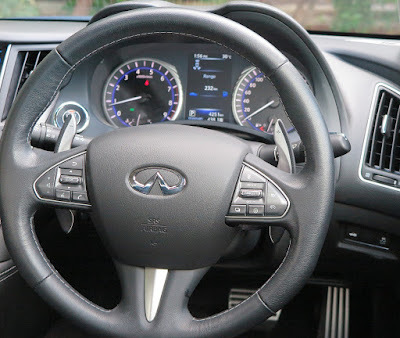 Sweeping through my regular test route at speed, I was rapidly re-calibrating my assessment of Infiniti’s mid-size sedan, relative to the biggest seller in this category – the Mercedes-Benz C250. You’ve missed the mark made by the Merc! Maybe by a smidgin; maybe by a mile, but despite the great V6 engine; impressive interior; comfy seats and relaxed touring gait, the Q50 just can’t match the C-Class. Okay, let’s reset and start again. In my first few hours behind the wheel I was very impressed. The Q50 is built on an entirely new platform, and this version’s V6 engine has bloodlines you can trace all the way back to Le Mans. Sounds great right? There’s more to come, because Nissan is a very capable carmaker, with a distinguished history of engineering innovation. 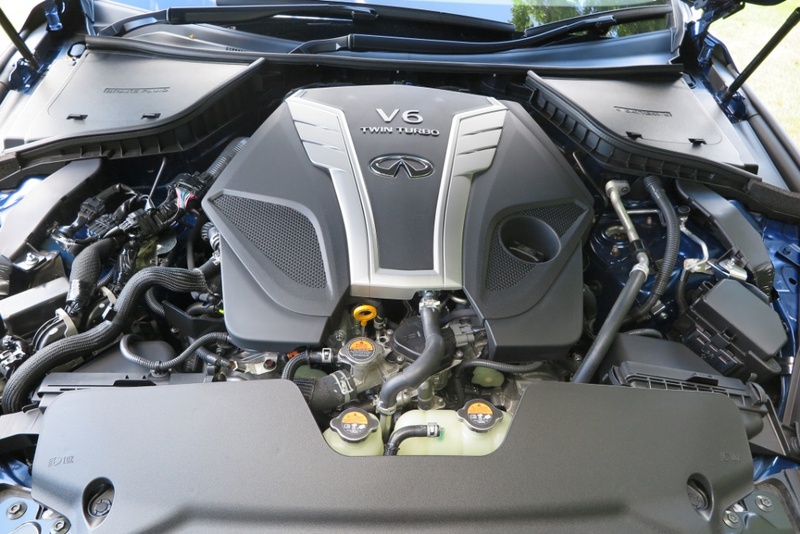 For example, just like the V6 powering GT-R 'Godzilla', the Infiniti’s all-alloy V6 has arc-sprayed mirror coating on the cylinders bores, in lieu of conventional cylinder liners; plus twin turbochargers and twin overhead camshafts. The torque spread is silky smooth and linear, and the engine happily revs out to its redline which really encourages bad behavior. 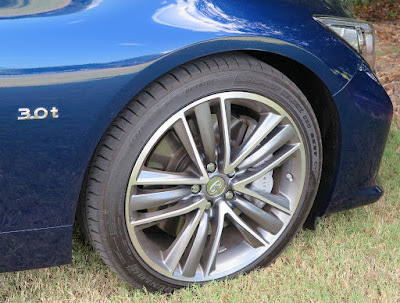 Matched to the well-calibrated and smooth Jatco JR710E 7-speed (torque converter) automatic, I found the drivetrain to be responsive and plenty powerful. 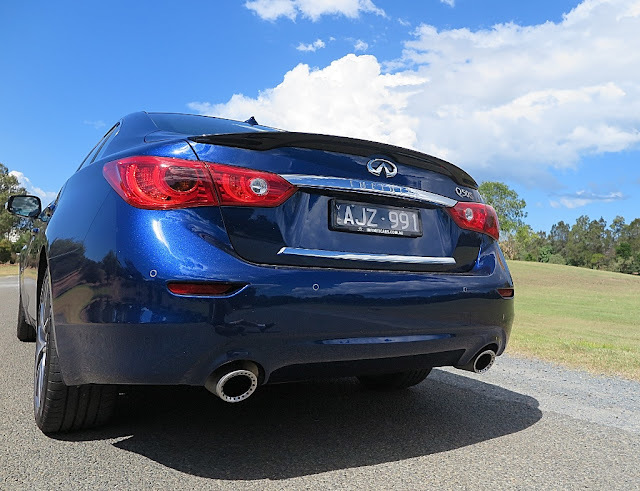 It’s one of the most impressive facets of the Q50S. However, despite a brand new platform the chassis feels under-developed and lacking stability on the limit. The issue is that the wheelbase to track ratio is all wrong, in my opinion. The car looks and feels too narrow, and the result is that on the limit the rear end wants to step out, a bit like an older rear-engined Porsche 911. 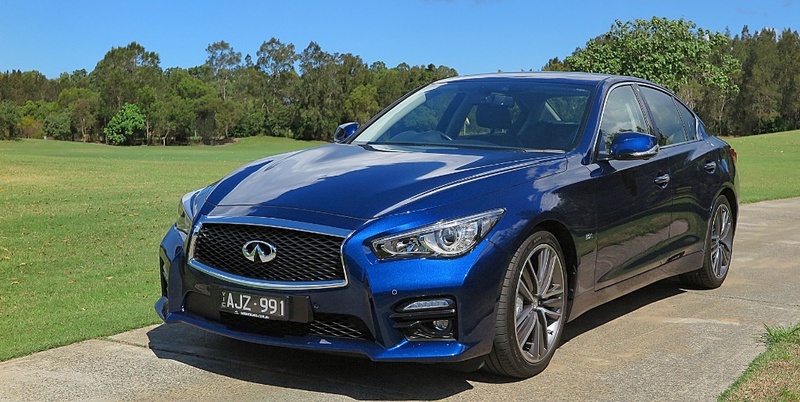 It’s quite disconcerting, and certainly one of the areas where in comparison to the Mercedes-Benz C-250, the Q50 simply doesn’t measure up. The secondary ride also gets a bit ‘jiggly’ too, on smooth surfaces, which may be more down to the Dunlop SP Sport Maxx 245x40 tyres on 19 inch rims, than just suspension tune. Whatever. You can’t change the track, but I think the ride and handling boffins could reach a better ride and handling compromise than the current car offers. But, in the final analysis, I’m nit-picking. 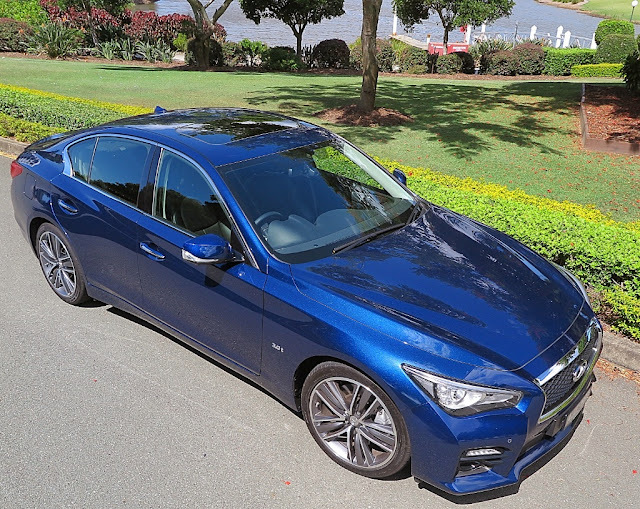 This is a very nice, comfortable, well-equipped touring car, and if you are not a ‘badge snob’ you will find it responds beautifully to your inputs, putting you easily within reach of a few speeding tickets, because it really is quite fun to drive. In the cockpit however, it still has the stupid, disengaged triple-screen setup; and a less-than-useful centre info panel, plus there's no digital speed readout. In addition, one of its most annoying features is that it does not automatically return to what you were listening to when you last switched the car off. How hard can this stuff be to sort out? 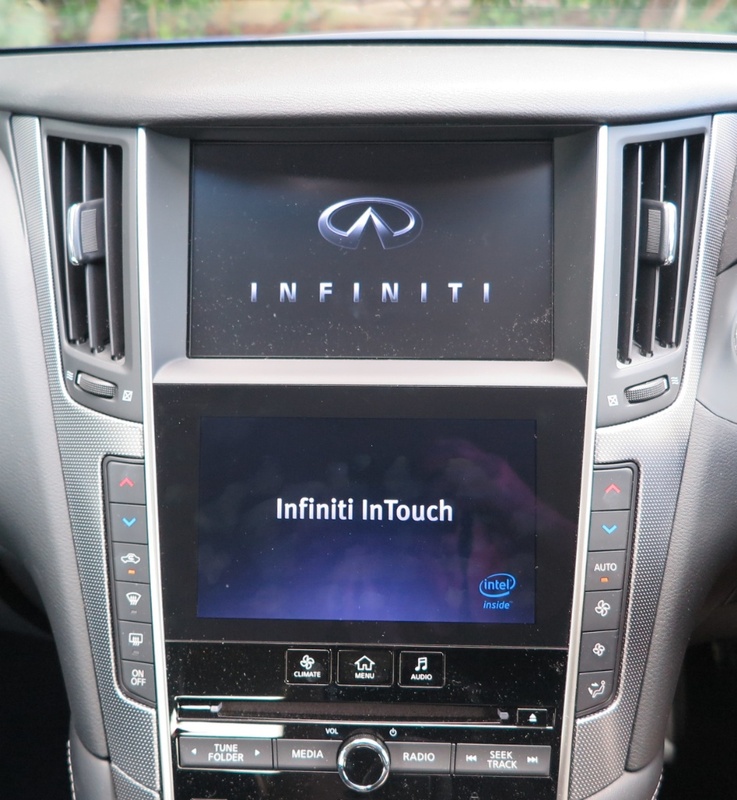 I’ve been pretty hard on Infiniti over the years that I’ve been publishing Driving & Life, but I do not resile. Nissan is an exceptionally able and technically-advanced car company, but I always get the impression that although it intends Infiniti to be a class-leading brand, with competency the equal of Lexus and the Europeans, it never quite delivers on the promise. I am picky, but I am definitely not a brand snob. There are a lot of cars, which may not be considered fashionable to own by those who are Euro-centric, which I would happily have in my garage – and the Infiniti Q50S is one of them. However, I have to say again. I LOVE my Alfa Romeo 159. It’s SO Italian!